Tropic Bowl, presented by Athletes Without Borders (AWB), is the longest-standing, internationally friendly, and annual American football event in Costa Rica. 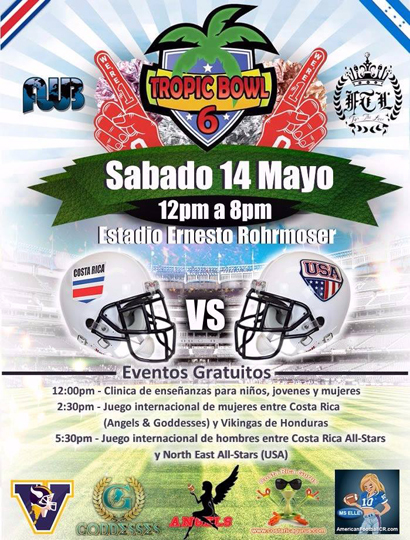 On Saturday, May 14th, the Tropic Bowl completed its sixth edition at Ernesto Rohrmoser Stadium in Rohrmoser-Pavas, San José; a fitting venue for the vastly popular American football event, located only a few hundred meters from the Embassy of the United States of America. 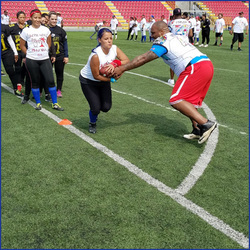 Each year, organizers of the Tropic Bowl have adapted the event day schedule to accommodate the ever-evolving progress of the local American football league(s) in Costa Rica. However, the one constant that has always remained the same is the feature game of the North East (USA) All*Stars vs. Costa Rica All*Stars. The USA team is made up of semi-pro players mostly based out of the Massachusetts, Connecticut and New Hampshire areas. The Costa Rican team combines players from both the Costa Rican Federation and Private leagues. The Tropic Bowl is the only American football event in Costa Rica that doesn’t differentiate players participation because of leagues. North East (USA) All*Stars MVP: WR Nelson (Nelly) Montas # 17 from Boston, Massachusetts, USA has been playing semi pro football for nine years.
" 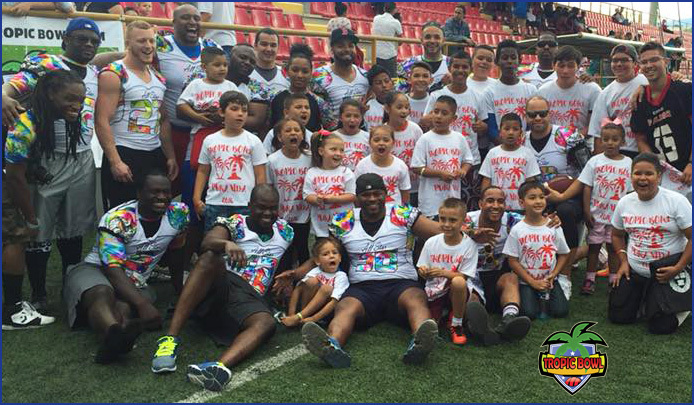 Playing in Costa Rica was the best football experience of my life and I enjoyed teaching the youths more than winning a MVP award. Thank you Costa Rica !!! " 3rd Quarter: 3 Touchdowns! Scoring action heated up when GODDESSES CR F.A. players Floriam Vanessa Rios made a reverse touchdown run followed by Aymara Reyes Reyes reverse touchdown keep for 25-yards. A feat considering Reyes was still limping from a sprained knee only a month prior to the game. *GODDESSES CR F.A. player Mariel Valentine McKenzie played both sides and had a touchdown called back for a face mask penalty. Valentine assisted the defense to hold the score at zero. *ANGELS F.A. player LB Claudia Amador Atencio was a major force to be reckoned with as she had over 15 solo tackles and had no mercy on defense. Amador played every play on defense. 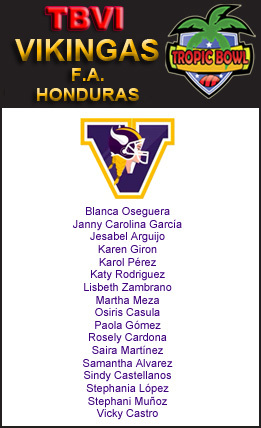 Vikingas Team Photo Coming Soon!